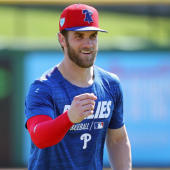 Hermosillo (groin) is starting to ramp up his baseball activities, Rhett Bollinger of MLB.com reports. Hermosillo is recovering slower than expected from scar tissue breakup in his groin following offseason surgery, but the outfielder is still expected to return to game action before the end of spring. "Today was the first time he had a look on his face where he said he feels much better," manager Brad Ausmus said. "He's finally trending in the right direction." At this point, Hermosillo seems unlikely to get enough at-bats in before the start of the season, meaning he could be headed to Triple-A Salt Lake to begin the season.